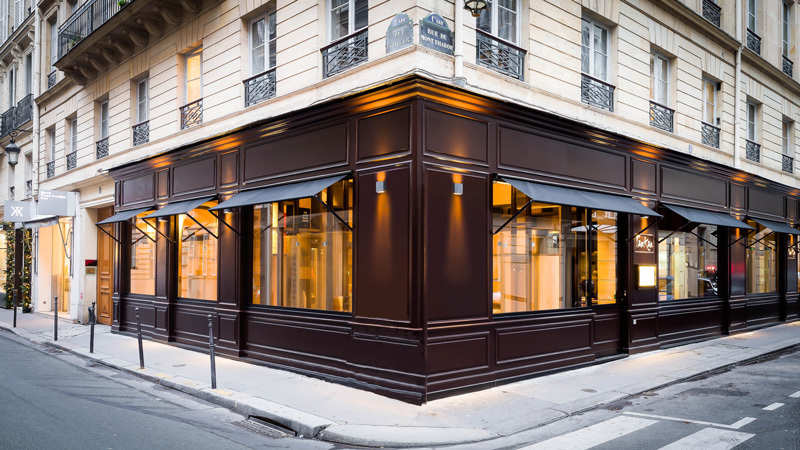 Things are happening at Taokan, the Chinese gastronomic restaurant, that has made its marks in just 3 years, in Saint-Germain-des-Prés! The Taokan House has indeed crossed the Seine 4 months ago, for the Saint-Honoré district, to open a second restaurant with the same concept as at Rue du Sabot: a decor which is plain yet ‘chic’, by the same architect-decorator stars, Hélène and Olivier Lempereur, featuring an open-plan kitchen, where dinner guests can watch the chef, Au Tien Dat, cooking “live”. Taking up residence at Rive Droite, Taokan House also exports its expertise in breaking the codes of well-known Chinese food and offers a new vision on a creative, qualitative and top-class basis. After spending 7 years in the luxury industry in Hong‑Kong, Christophe Daine, founder of Taokan, has acquired a strong sense of beauty, excellence and detail. Light and refined, he preserves and embellishes Cantonese style cuisine by using only fresh ingredients and by offering only, and entirely, homemade dishes, the soy sauce included! The chef, who currently oversees the operations in the Saint-Honoré district, comes to Saint-Germain once a week where he keeps carte blanche to create dishes that do not exist elsewhere, like the maki style crayfish and fresh herbs spring roll, or this astonishing Dim Sum with foie gras, this innovative chocolate coconut balls or the Loc Lac Beef, spicy beef fillet, Taokan style, unmissable signature dish of this gourmet place to be. This new momentum is accompanied by new dishes to taste Rive Gauche or Rive Droite. It’s now up to you to discover and succumb to the Long Xia Jiao, crayfish and green raviolis or of two original accompaniments: Chao Bo Cai, stir-fried spinach, soy sauce and peanuts and Suan Tian Gie Zi, fried egg-plant, sweet and sour sauce. Last, but not least, come taste and savour the surprising Nuo Mi Ci, mango coconut balls. Taokan has not finished surprising us!